The night before I had showed up in Austria late at night and took a cab to my hostel. I had no plans. I had no expectations. Lately, I enjoyed just showing up and going with the flow. I got to Doug’s Mountain Getaway (which is actually my favorite hostel now). 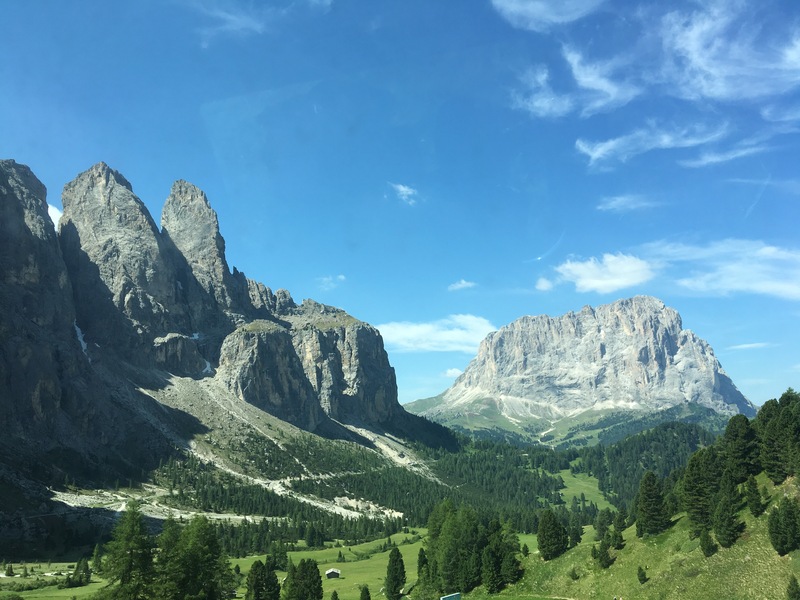 The staff said they were organizing a trip for the morning where they would drive to Italy and climb the Dolomites, the Italian Alps, no experience needed. I said ,”Sure!” I love to rock climb, so this worked out perfectly. I woke up early to get ready. I had left from class the day before and took two flights to get there, no chance to get to a grocery store before my late arrival. The kind people at the hostel said I could share their food if I needed something, and I had had some cereal in the morning. I figured I’d be fine. We began our drive to our destination. 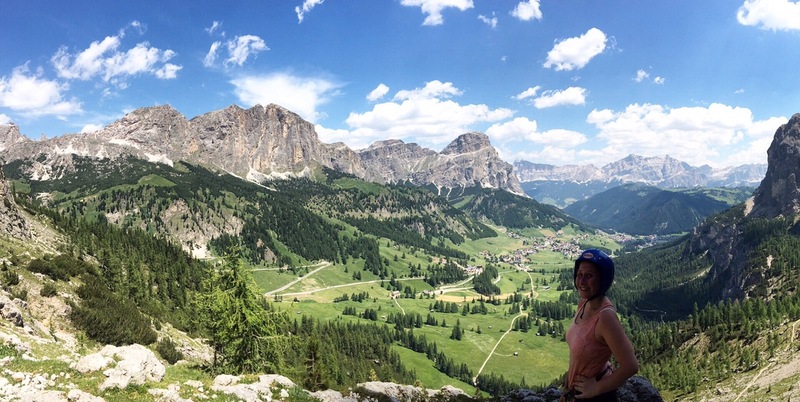 It was my third time to Italy and I was about to climb the Alps on the fly! Thank goodness I packed athletic clothing and shoes last second. The mountainside began to open up revealing towering landscapes of rock and wildlife. It was a gorgeous day with the sky painted with clouds. It looked too perfect. I started to notice how steep this looked, how the car just kept winding and winding up the mountain past the bikers, how this was not going to be a stroll in the park hike I had in mind. We got out and I looked around. I couldn’t believe I was there, that I stumbled upon this experience. I felt ready! We parked the car and stared up at what seemed like a very vertical mountain face. We got up close and stopped to put on our gear. There was a metal cable going up the mountain that we would clip into with the carabiners, moving one at a time to the next sections so that we wouldn’t fall. I love to climb and started scaling the mountain. I felt strong and so lucky to have this opportunity. We came to a flat part and unclipped and walked, then started to climb again. This time I realized maybe I hadn’t eaten enough. I started to slow down and feel hazy. Had I drank water at all after class the day before? I got to the next spot where I could walk without the cable and paused, breathing heavily, downing my water. I knew it was the perfect temperature out, but I felt too warm. Had I bitten off more than I could chew? The hostel crew was so kind and offered me some of their water. Over the next three hours I climbed this mountain. My old running shoes stepping in holds, my glove covered hands digging to good grabs, using my upper body strength to haul my body up a few feet with the cable, I tried to focus on what was directly before me rather than how much more there was left. My entire body ached. I kept stopping for water, the last in the group with a hostel guide behind me. Thankfully, I wasn’t far behind and didn’t lose site of the group. If I had been afraid of heights it would have been another story, but when you’re that high up it doesn’t even look real. I trusted my gear and the views were stunning. I kept looking up and thinking that it was almost over, but then I’d get to where I thought it topped out and it would still be vertical. It had been almost entirely vertical. Things quickly went from tough to almost impossible. My muscles were giving out. My legs started struggling in bringing my body weight upwards. My arms were starting to feel dead. I was so thirsty even though I had drank probably more than anyone else in the group at that point. As we got higher in the elevation, it felt like I was breathing through a straw. My lungs felt like they were only expanding about an eighth of the size that they should. I came to another set of metal rungs. My body was done. I had finally, for the first time in my life, bit off more than I could chew. The guy who worked at the hostel was incredibly sweet and helpful. He made me feel like we were a team. He was literally taking my feet from below me and moving them to the next hold. We got to a spot where he could give me a granola bar and more water. He encouraged me. I felt awful for holding him and the group up but he assured me it was fine, that we could see them anyways so they weren’t too far ahead. Mentally, I pushed all the negativity down. I was worn out, but I was going to get to the top. Seeing that little restaurant at the top with some snow surrounding it seemed like a little piece of heaven. I unclipped my carabiner from the final part of the metal cable and nearly collapsed. The air was so thin but the view was worth it all. Mountains surrounding us, the tops equal height to us. I did it! I had conquered the Alps! The vegetable soup and beer at the restaurant was everything my body needed. This was no easy hike. This was the most physically exhausting thing I have ever done. The group was amazing as we sang and stumbled our way back down the mountain by way of a much easier route. Driving back down the mountain I felt such a sense of awe. How did I get out of class yesterday not knowing I would be having the most astounding day of my life climbing the Italian Alps the next day? 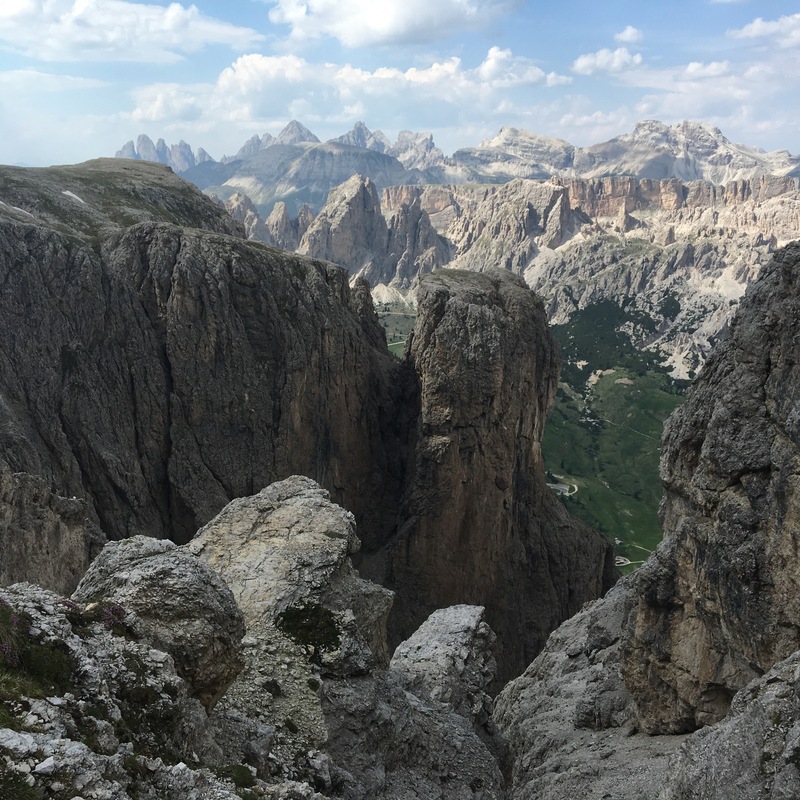 Admittedly, the Dolomites had not been on my bucket list, because I had never researched them, but to go with a group who had had been looking forward to this trip for years made it all the better. 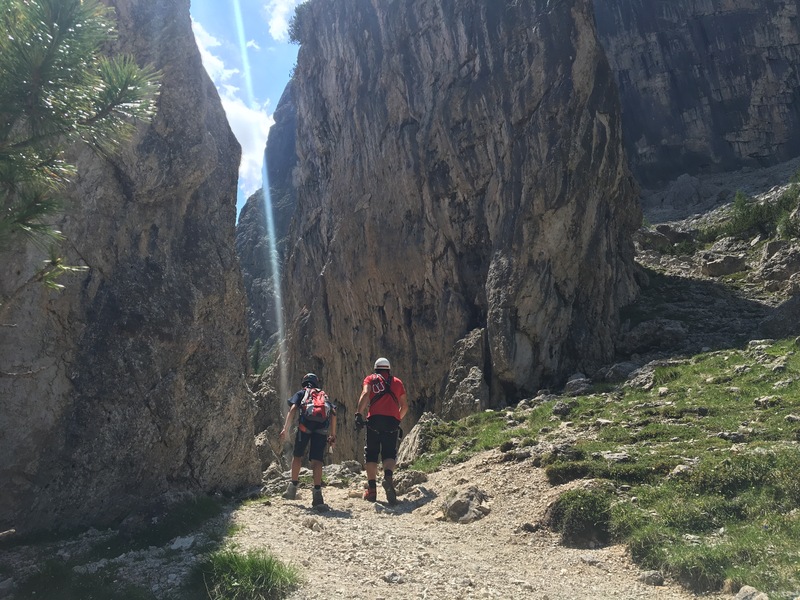 The experience with Doug’s Mountain Getaway, between the atmosphere of the hostel, the staff and the guests, combined with this trip to the Dolomites helped create my absolute favorite travel adventure.